Classic stainless steel gent's watch, black or white dial , stainless steel link bracelet, quartz movement with date, water-resistant to 50 meters.All ADI watches come with a one year warranty and are shipped in an attractive aluminum case. These watches are made beautifully and priced very competitively, for exceptional value. Most styles can be custom imprinted on the face for events, bnai mitzva, or as promotional items, in quantities of 50 or more. Click on any product image to see a larger picture. 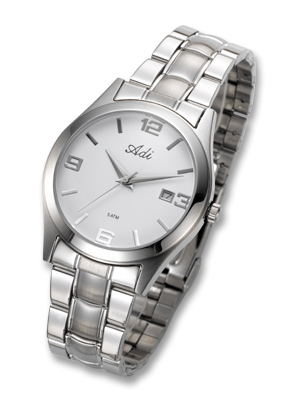 Each watch is packed in an elegant silver colored gift box.